Kayak touring involves a group loading their boats with all the camping gear and supplies needed for a several-day paddle. Ideally, launches and camping spots for kayak touring are spaced about a day’s paddle apart, say 10-12 miles for the average paddler. Another requirement is that the launch spot should be reasonably secure so that you have some assurance of finding an operable vehicle when you arrive back from the trip trying to drive home. The Potomac is one of Chesapeake Bay’s “Five Fair Rivers,” mentioned by John Smith and is home to a large part of the Captain John Smith National Historic Trail. Chesapeake Paddlers Association has a long tradition of kayak touring on the Potomac, and I’ve been trying to revive that interest and push various state and local agencies into better accommodating water-borne touring for the last few years. 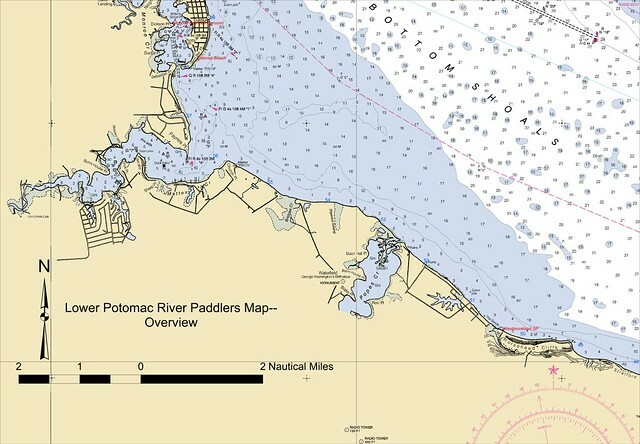 In 2015, the Potomac Passagemaker series of paddles covered the entire river from Washington, D.C., to Point Lookout, but only two of those 10 trips involved camping, and only one was a kayak camper. In 2016, we tried to link three of Virginia State Park’s new paddle-in campsites (Leesylvania, Caledon and Westmoreland) in one three-day tour covering 56 nautical miles. nbsp;The July heat that weekend precluded making it to Westmoreland State Park, our final destination, and we terminated at the Rt. 301 bridge. 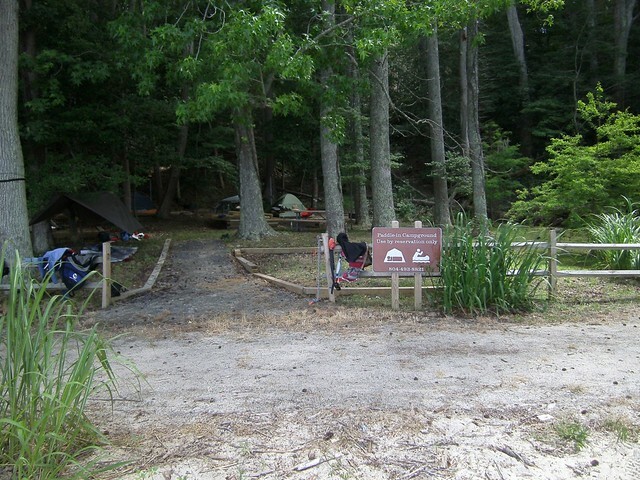 Recently, I planned a more modest overnighter to inaugurate the new paddle-in site at Westmoreland State Park. Originally, we had planned to launch from Coltons Point in Maryland and do the 8.6-nautical mile crossing to Westmoreland State Park. However, the weather forecast called for nearly continuous thunderstorms for Saturday, and 3 miles into an 8-mile open water crossing is no place to be in a T-storm, so we developed Plan B. 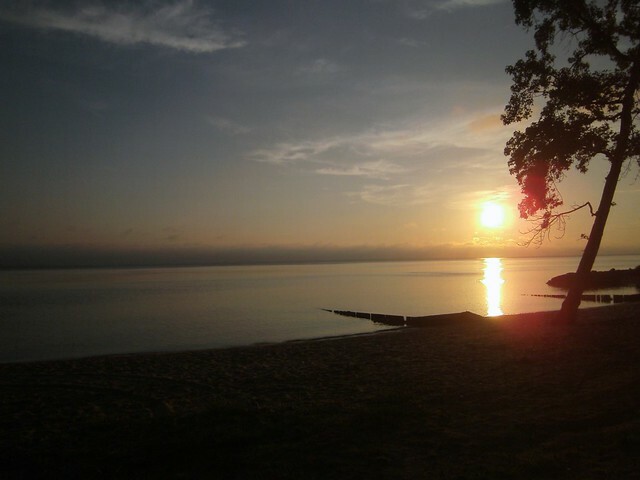 We chose Colonial Beach, about 8 nm upriver from Westmoreland State Park and identified Monroe Bay Campground on Dickson Point as likely to provide the security needed for our vehicles. A quick call to the campground confirmed that we could park for a $5 per head per day fee and we were set. The reservation at Westmoreland was a bit more complicated. The paddle-in sites are under a special use permit, requiring submission of a generalized 3-page permit application, most of which is not applicable. Given our previous issue with paddling the distance, I put off payment until arrival. Early on Saturday June 17, four of us (CPA paddlers Tom Heneghan, Dan Minton, Chip Walsh and I) arrived at Monroe Bay Campground under lowering skies, moved boats and gear down to the beach and loaded our boat. When the campground manager arrived at 8:30, I paid our parking fees and we launched into the sleepy confines of Monroe Creek, heading out the channel into the Potomac. The forecast must have scared everyone else off because nary a boat, jet ski or paddler stirred except us as we paddled down the shoreline past the mouth of Mattox Creek. As skies started to brighten and patches of blue appeared, we came onto an inviting sand beach where folks were fishing and beachcombing. Being in no rush, we decided to paddle into Bridges Creek and meandered a mile or so back into the winding, reed-choked creek. Washington’s Birthplace National Park protects the eastern shore of this creek, and the sandy beach at the mouth is part of the park, accessible on Bridges Creek Road. This is another potential launch site to investigate, but car security would be an issue. We left Bridges Creek behind and paddled around a clearly eroded shoreline of planted pines, chasing a pair of adult Bald Eagle and three immature birds as we paddled along. We came to another sand bar marking the mouth of Popes Creek, the namesake for the plantation where George Washington was born. If this is the spot on the Potomac where George threw his dollar across the river, a dollar definitely went a lot farther in those days. We paddled into the creek, and decided to break for lunch at a landing marked by a short, steep bank and wooden stairs, leading up to Duck Hall Point picnic area. 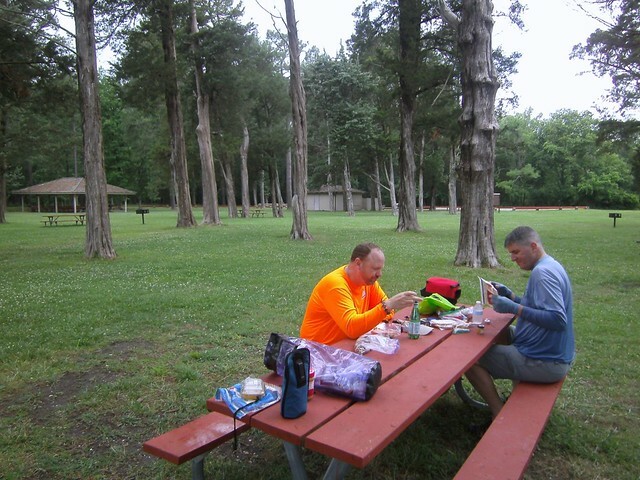 This beautiful area of old Eastern Red Cedar trees and open lawn was also completely deserted, so we had our choice of picnic tables, a nice restroom and even picnic pavilions if we had needed shelter from forecast T-storms. After lunch, we paddled farther into Popes Creek, but realized when we came to the Visitor Center building with no landing that we should have walked there from Duck Hall Point. 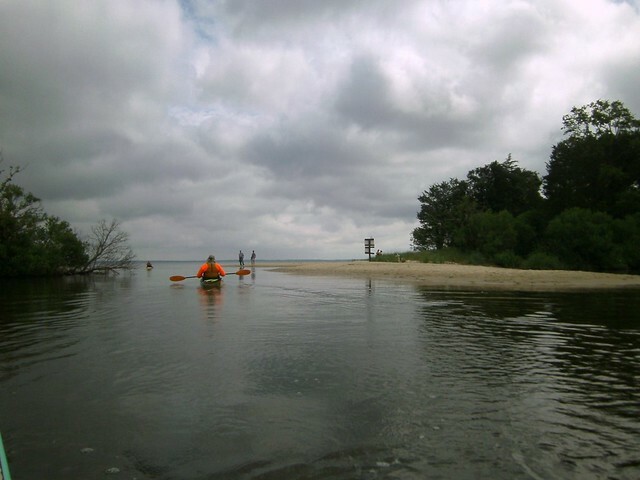 We turned around and paddled back out of Popes Creek, on our way to Westmoreland State Park. Our final push took us along a settled shoreline of numerous small houses, the park boat ramp, the Potomac Retreat cabin, beach parking lot, swimming pool and restrooms, and picnic areas. Finally, at the very downriver end of the park, just before the Westmoreland Cliffs loom high above us, we arrived at the beach for the paddle-in campsite. The site is surrounded by a split log fence, and has three pea gravel tent sites framed with timbers, fire rings, picnic tables, and lantern poles, and a fourth handicapped accessible tent site under construction. The sign on the campsite had a telephone number and I called to see about making payment. Just as I did, a park vehicle drove up carrying Ken Benson, the Park Manager. He introduced himself and we talked about where we’d launched, that I’d put in the permit for the site, and had just been told to hike up the hill to pay for it. He admitted that we were in fact the inaugural users of the site, and offered to waive the fee in return for some feedback and help in getting the word out. He said he was trying to get the site into the regular reservation system, and we mentioned that the Caledon State Park site had a self-service kiosk for payment. Ken explained that the bath house restrooms would stay open for us, that we could get a pool pass (we decided to just swim in the river in front of the site), and offered to have some firewood delivered for us. 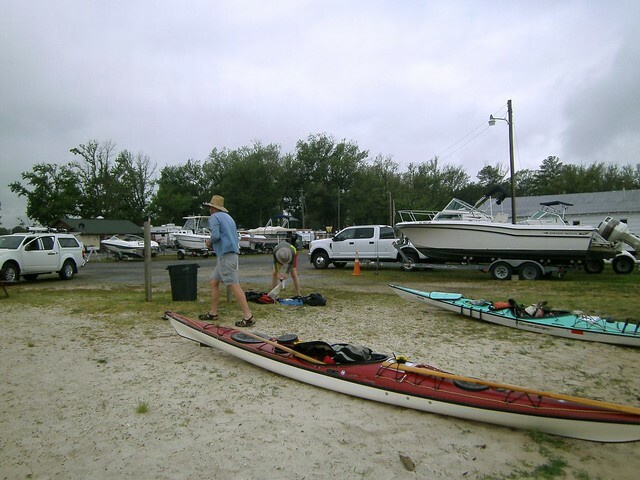 We praised Virginia State Park’s efforts to develop paddle-in sites, talked about the problem of distance between them and thanked him for his welcome and leaving his personal cell number in case we had any issues. We set up camp and spent the rest of the afternoon much as the day trippers in the picnic areas adjacent to us did: lazing around on the beach, swimming in the river, and strolling down beneath the cliffs to check out the pool, restrooms, and snack bar. While not as remote as some paddle-in sites, the one at Westmoreland State Park makes up in amenities what it lacks in privacy. 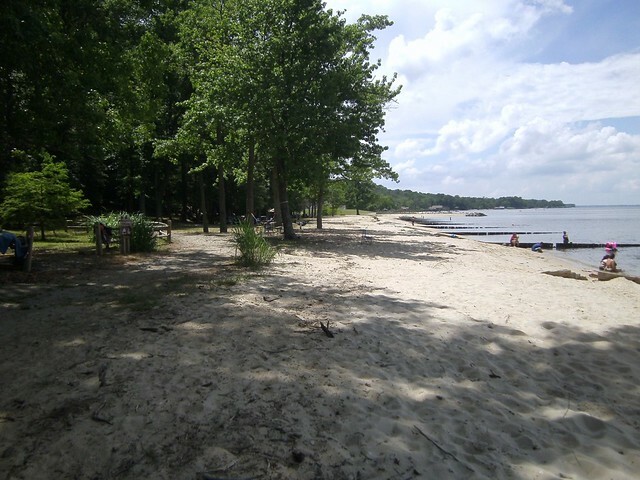 There is water, electricity and shelter (in the event of a major thunder boomer) in a picnic pavilion immediately adjacent to the campsite, and full restrooms and showers a short walk down the beach. If you like snack bar food, you don’t even have to bring stuff to cook. As a bail out, you could even spot a car at the beach parking lot (make sure the rangers know you are doing it). Given how busy the beach is on weekends in the summer, we also thought that tours in the fall or winter months, or on week days would be more secluded than competing for peace on the summer weekends. By late in the afternoon, all trace of potential T-storms departed and the skies cleared, making for a glorious sunset and calm, still, peaceful evening. We turned to dinner, and got an expert disquisition on the use of the Biolite wood burning stove from Dan Minton as he set about using BBQ wood pellets to cook his Silver Turtle version of a shrimp boil. I also cooked shrimp and pasta, and Tom and Chip were cooking variations of curry and rice. It was quite a gourmet turnout for our one-night stand. 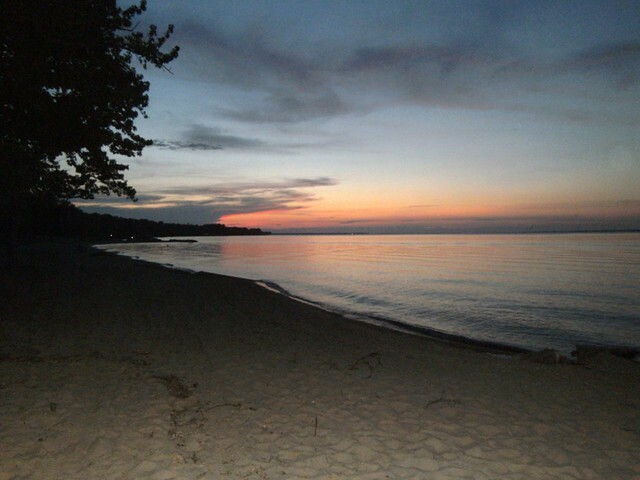 By 8 PM, all the day trippers had departed, leaving us in sole possession of the beach. Park rangers made a last check, emptying the refuse cans along the beach and ensuring that we wouldn’t be patrolled by raccoons. Stars glimmered as we lit a small campfire with our free firewood, and the only noise was the occasional fish jumping on the calm Potomac. As the fire burned to coals, we gratefully sought out tents and hammocks and drifted off. Later, a partial moon crept over the cliff top and shone down on the still waters of the river as the stars wheeled in heavens mostly clear of any clouds. Dawn comes early to the cliffs along the Potomac as the sun rises directly downriver during June. That’s fortunate, because at 6 AM on the dot, the day trippers begin to stake their claims on beach and picnic area again. We too, arose and started breakfast, reveling in eggs, sausage, and bacon, supplemented by Mrs. Minton’s banana bread. We started to dismantle our temporary homes, thankful for the dewless morning and the ability to pack completely dry tents despite the dire forecast. By 9 AM, we were back on the water, paddling downriver a bit to check out the cliffs (there was already a pair of fossil hunters daring burial beneath the cliffs). We paddled upriver again and bade Westmoreland State Park a fond farewell, moving into the day’s heat, with a nice, fresh breeze in our faces. Passing Popes Creek, we put in for a brief stretch at the National Park beach at Bridges Creek, and did a little fossil hunting of our own. Unfortunately, the only fossil uncovered was the one in my kayak seat, but we paddled on into a rising chop as the wind picked up and shifted to the south, hitting us from the stern quarter. There was far more boat traffic out on this sunny Father’s Day, so we had wake and chop to contend with and more to keep an eye on as we threaded into the channel at Colonial Beach, past the Dockside Restaurant’s Tiki Bar and up Monroe Creek. Legions of sunbathers were on the beach from the campground as we pulled in to land. One young lady asked how far we’d paddled and seemed shocked that we’d done 21 miles over the two days, as if such geriatrics as we doubtless appeared must be incapable of such a feat. Far better the 21 miles over two days than the 20 plus miles we had attempted and mostly done in the heat of July the previous year. Thanks to Tom, Dan and Chip for accompanying me on this somewhat experimental trip to visit the last of the new Virginia paddle-in campsites. Even though our initial plan (the river crossing) had to be abandoned, Plan B proved a worthy alternative and a thoroughly enjoyable way to spend most of the Father’s Day weekend. Thanks also to Park Manager Ken Benson and his staff at Westmoreland State Park for accommodating us so well and for his continued efforts to provide for paddle-in campers. This write up is partial payment for their many kindnesses. You can repay Virginia State Park’s efforts by getting out and trying the paddle-in campsites on your own kayak tour this summer or in another season soon. 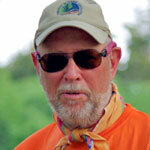 Ralph Heimlich is a Steering Committee member and paddler with Chesapeake Paddlers Association, Inc. He leads day and overnight kayak trips for CPA and works on water access issues.